Clay. Carving, white paint. 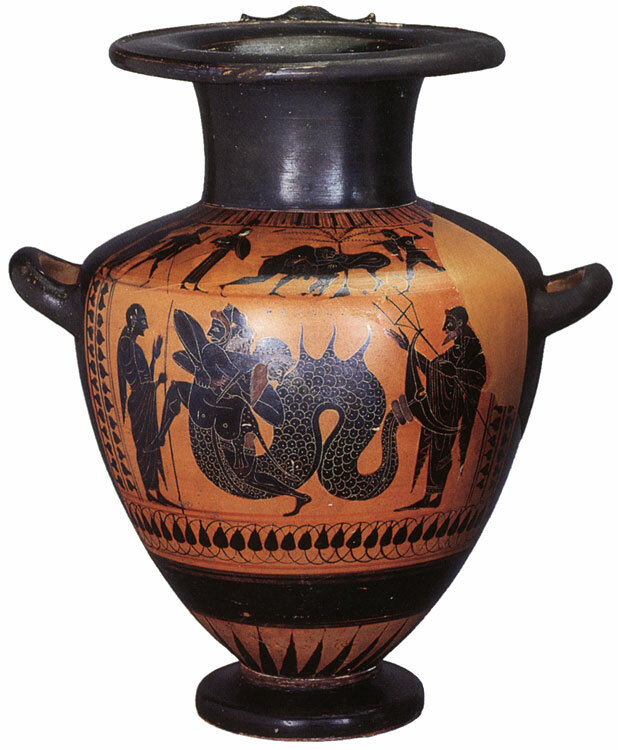 520—500 BCE. Height 40.2 cm, diameter of rim 22.8 cm, diameter of prop 13.8 cm. Saint Petersburg, The State Hermitage MuseumInv. No. Б. 1516. Heracles and nemean lion; Heracles and Triton. Height 40.2 cm, diameter of rim 22.8 cm, diameter of prop 13.8 cm. Receipt: from the Campana collection, acquired in 1862. © Photo, text: Antichnoe nasledie v iskusstve Zapadnoi Evropy. Katalog vystavki. s. 27 cat. No. 15.